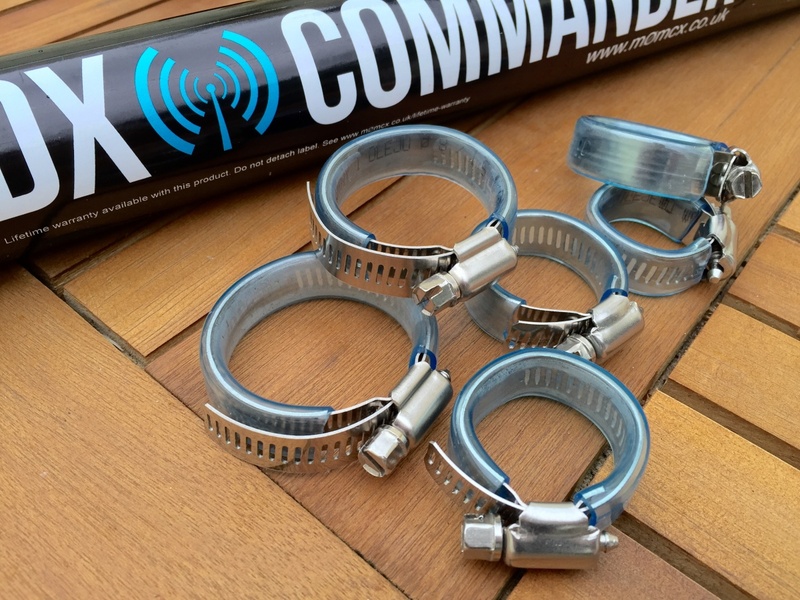 DX Commander Antennas: These are the best selling heavy duty telescopic antenna support on the market. 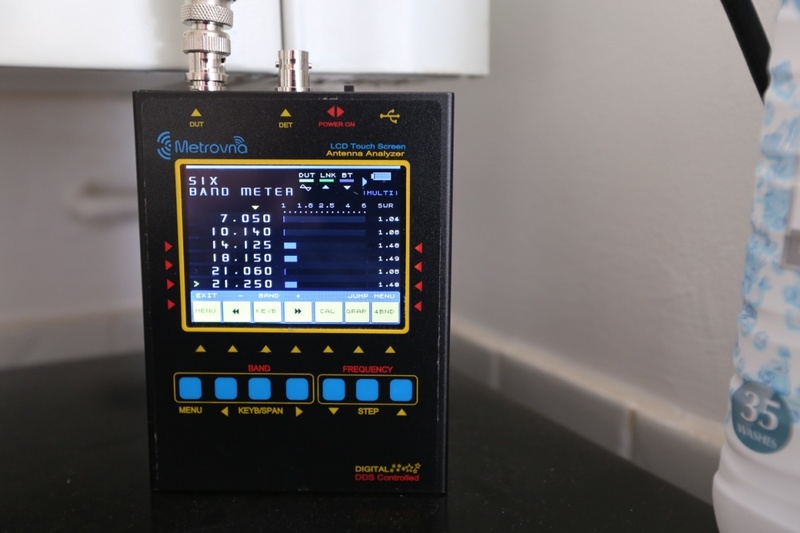 With over 500 sold and 100% track record, I know what I’m doing – and I use these myself in real-world RF applications. 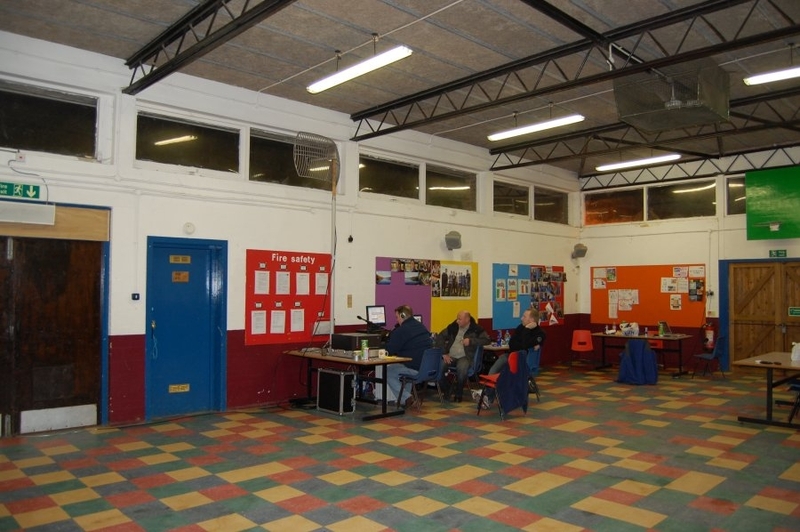 Club members, personal friends and other regular amateurs love the quality and (as yet!) nobody has broken one whilst using it as a vertical. I personally use these myself. 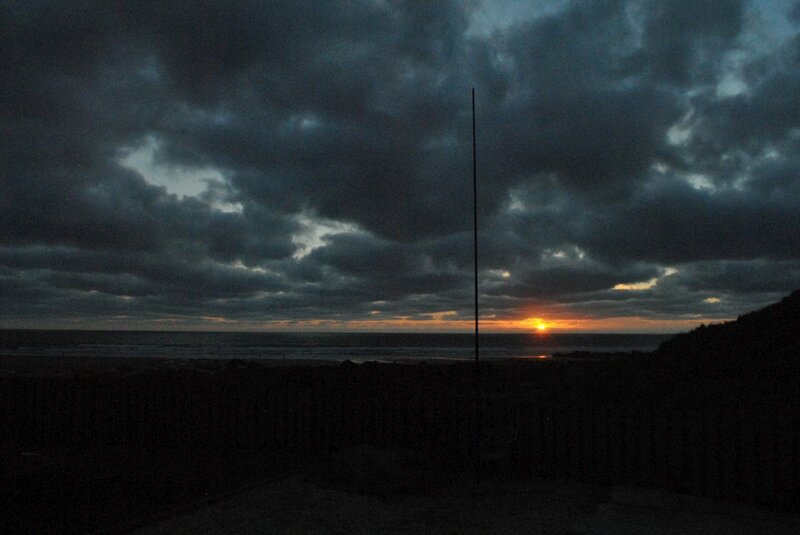 I’ve shipped to Reunion Island, France, Spain, Ireland. Feedback is always superb and I receive many repeat orders (when one isn’t enough!). These poles come packaged brand new, 1.2m length with a protective plastic see-through snap-top temporary dispatch bag. They telescope to at least 9.6m in length (sometimes a bit more depending on factory manufacturing tolerance) and weigh 1.4 kilos. If you need less height, just remove the appropriate number of sections off the top. 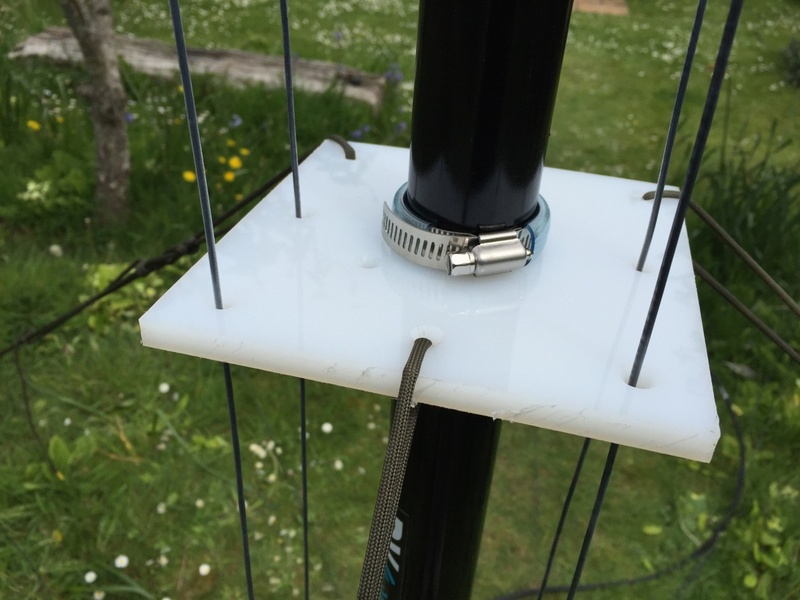 The base unscrews which will let you push the redundant bits back out the bottom. 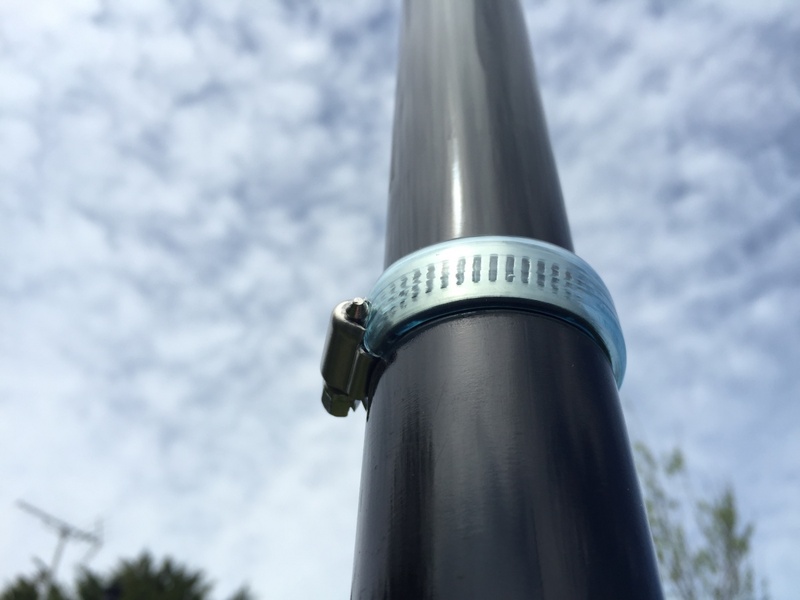 The inside diameter of this “10m” pole is 44.5mm (1 3/4 inch) which means you can internally sleeve an aluminium or fibreglass tube inside the base of the pole to give you lots of options for mounting. 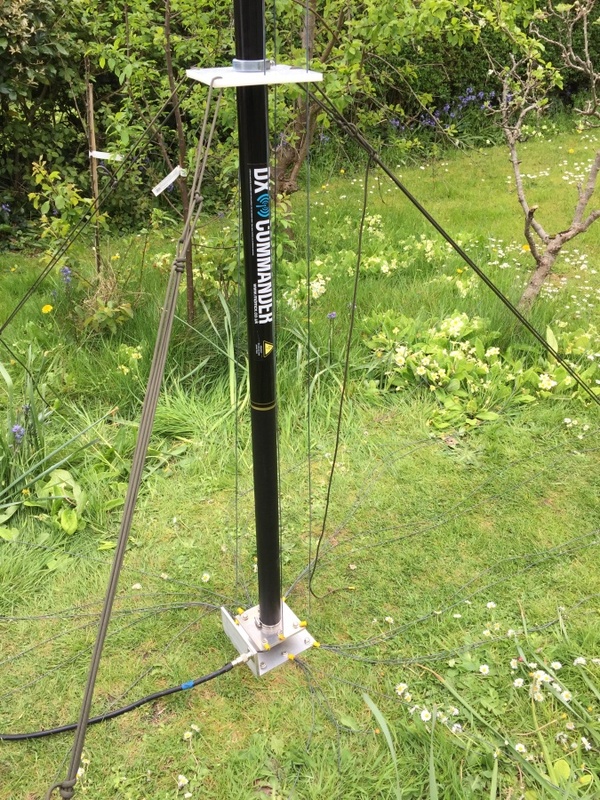 I have built these both free-standing by using an internal sleeved 44.5mm tube concreted to the ground as well as guying them at just above the first section. We also do various ground plates, and guy plates to suit. 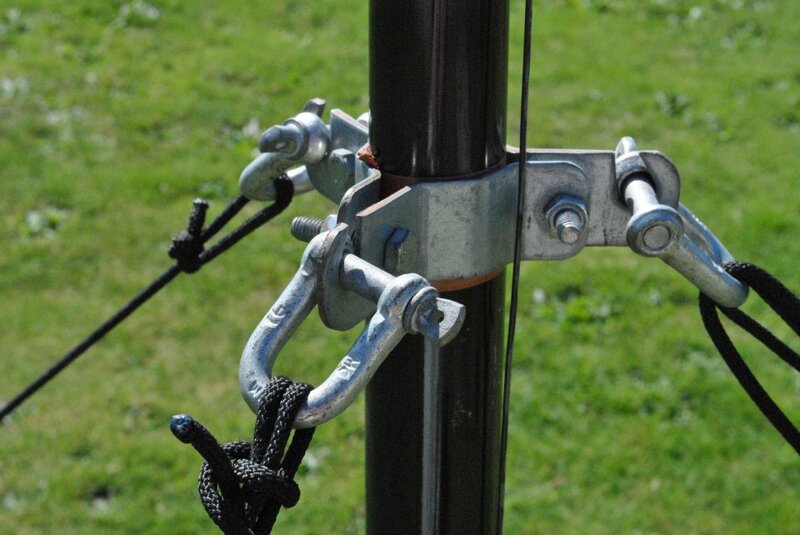 The top section is a solid section (not hollow) which is nearly impossible to break and has a tiny metal loop for aerial mounting options, for instance to loop the top of an inverted L though. 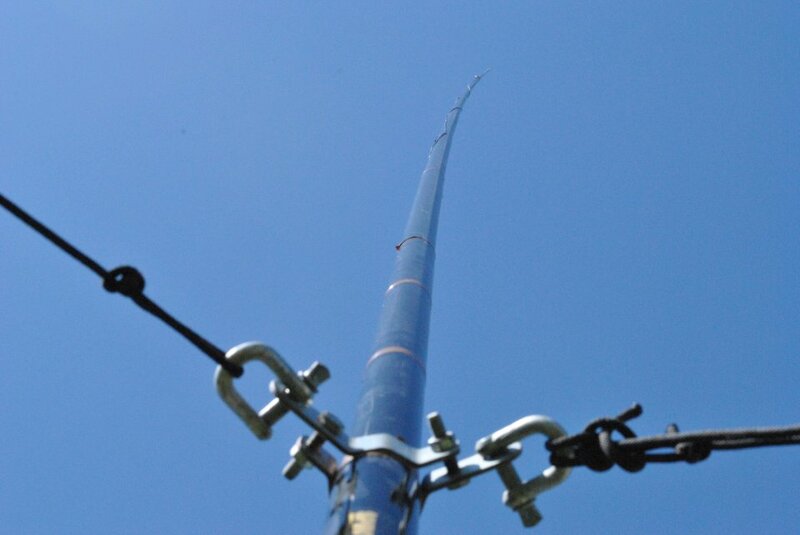 Don’t confuse these heavy duty flag pole antennas with cheap fishing pole copies that snap in the wind and sold as “professional” and sorted antennas. They may give you a 50 ohm, low SWR match but so does a resistor. 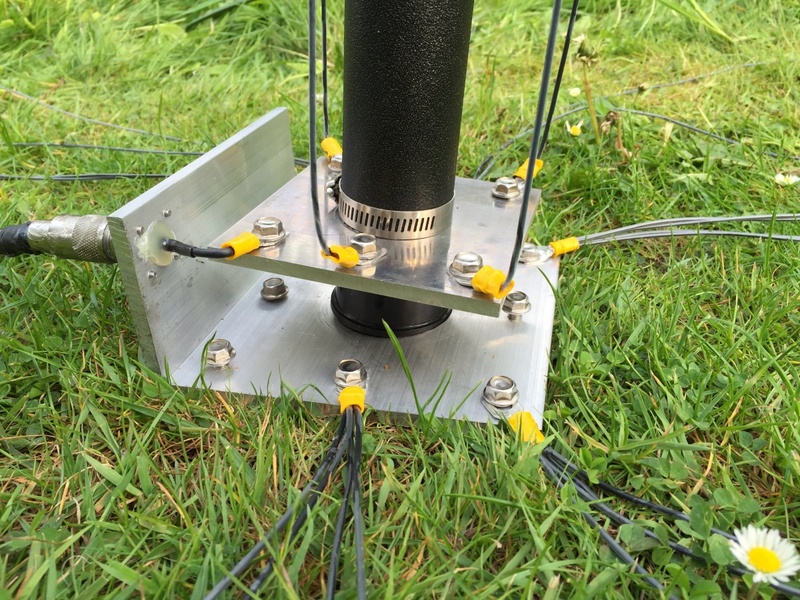 Customers have made 2-element yagis (awesome), rotatable dipoles and G5RV supports etc. 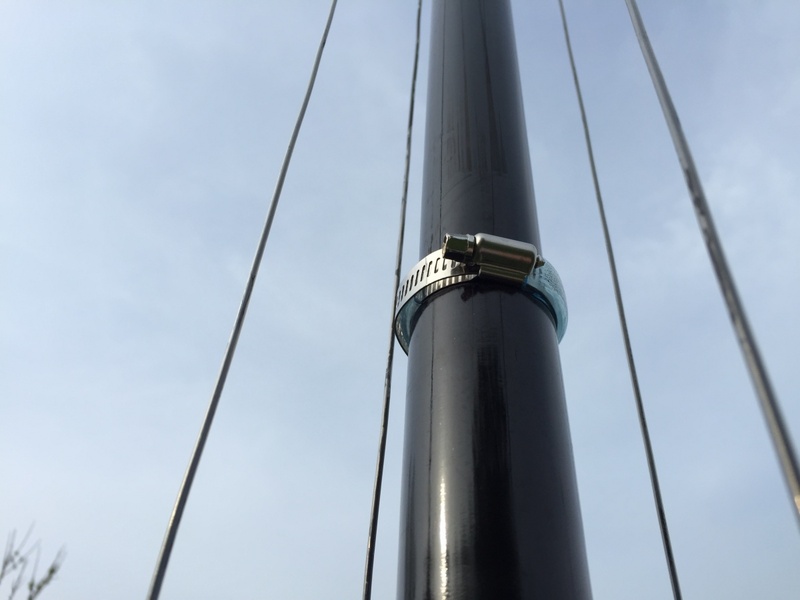 For G5s, Doublets and Dipoles removing the last three or four sections and achieve a very good vertical non-metallic support at about 7m height. 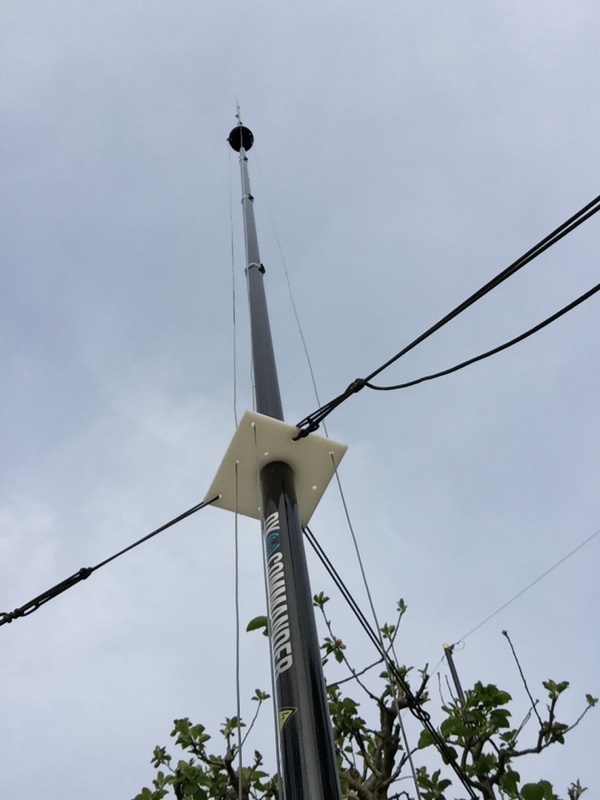 PLEASE don’t fit a large wire antenna to the very top. It will eventually snap under extreme tension. This isn’t magic. The added severe weight means it’s not practical. 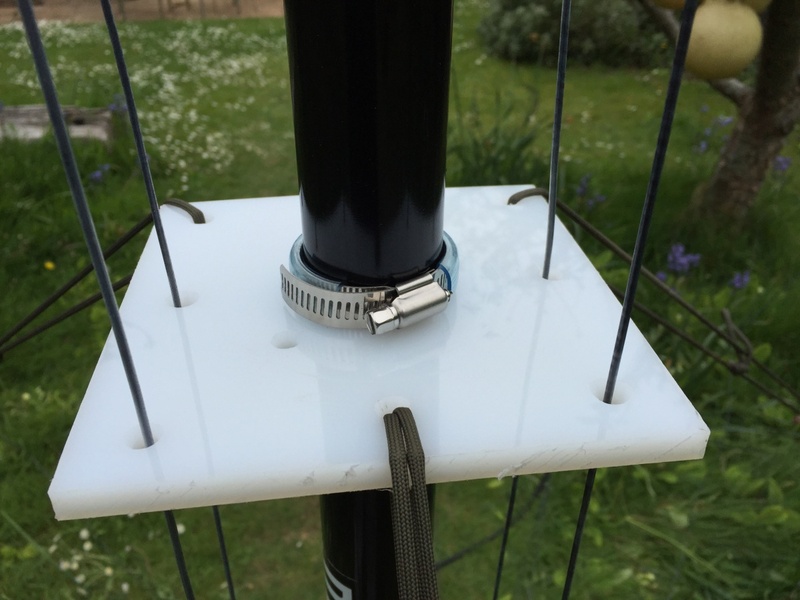 Just remember to remove the last three sections (or if it’s a heavy wire antenna, maybe the last 4 or 5 sections). 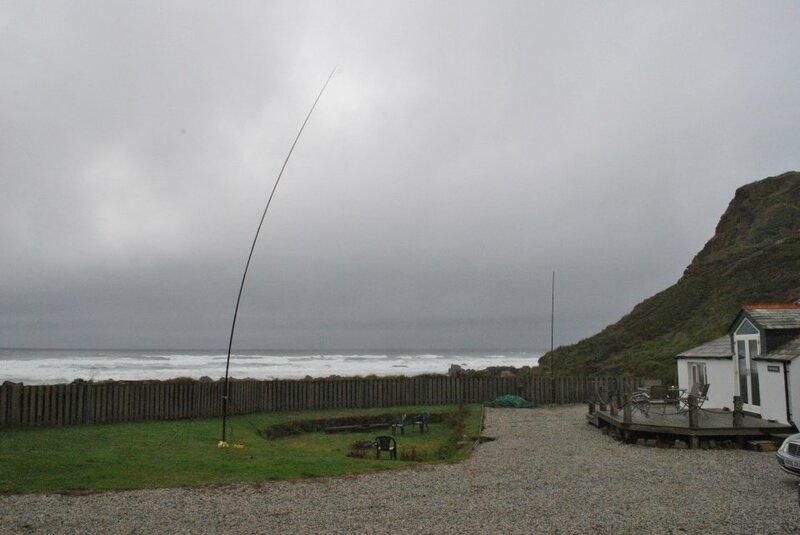 Remember that for 30m and below, an antenna 5m or so above ground will be absolutely fine. 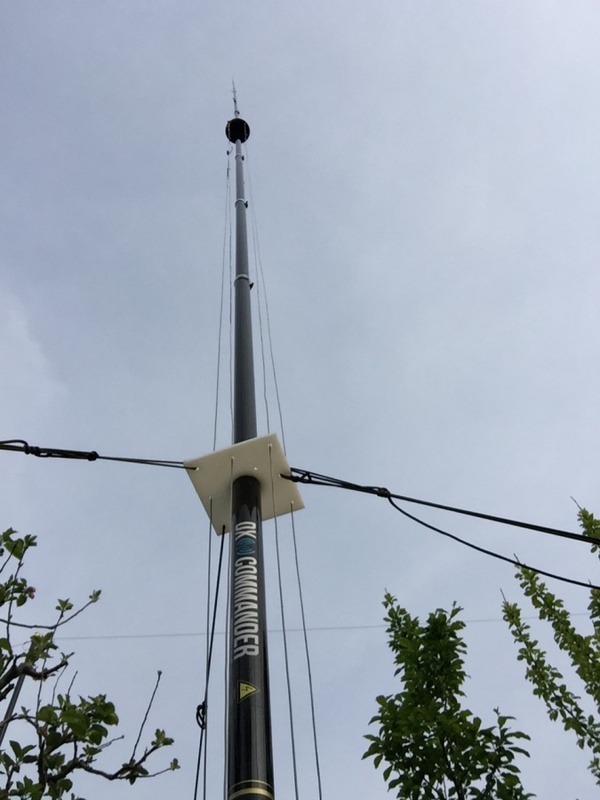 To get any appreciable gain with extra height, you’ll be looking at 15m (or more) height. 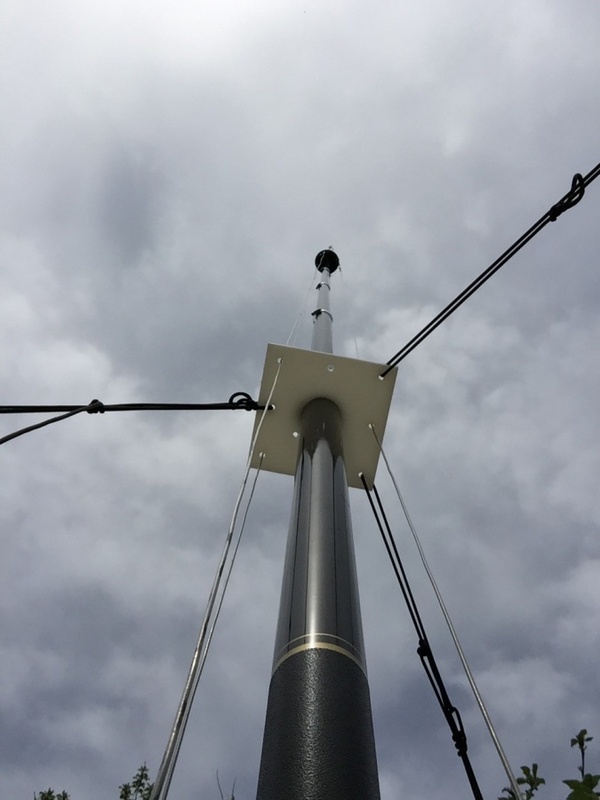 If you need extremely MASSIVE strength, you may be interested to know that a 6m aluminium scaffold tube with a sailboard mast sleeved on top gives a very strong 10m support. 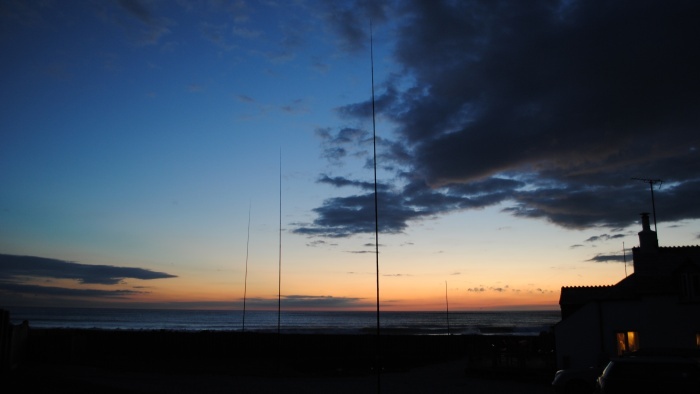 Did you know that verticals resonate on the third harmonic too, so a vertical resonant on 7Mhz will resonate at 21Mhz. In my practical experience, you’ll find the third harmonic will be a little higher, probably 21.3Mhz. 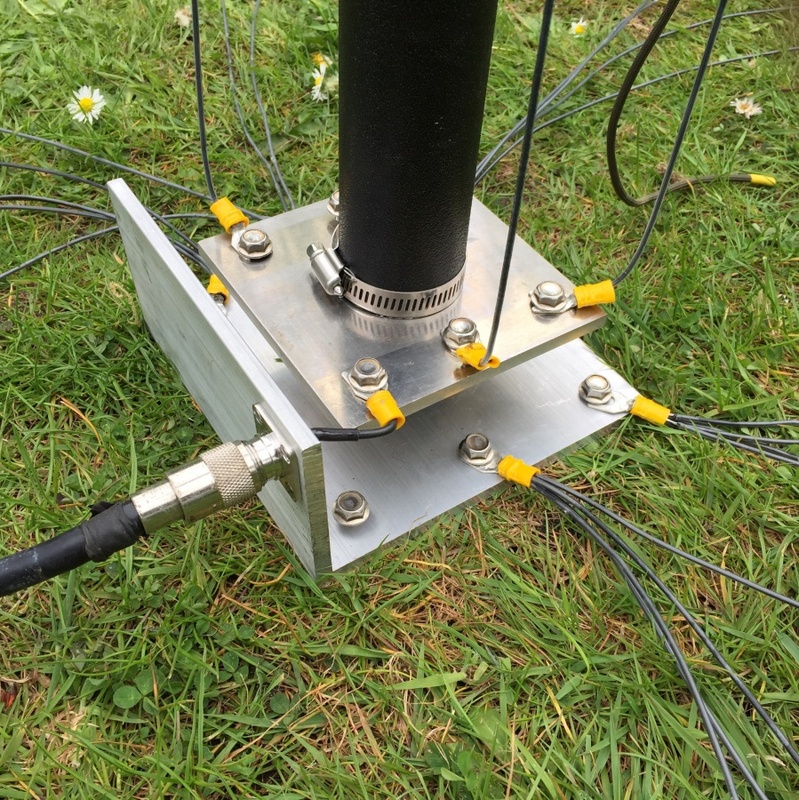 Made superb S9++ contacts all over the world with what is now a 3/4 wave vertical (just a teeny bit longer than a 5/8th) and contrary to popular belief, a 3/4 wave isn’t actually much of a cloud warmer after all, there will be some very useful low-angle gain on 15m. 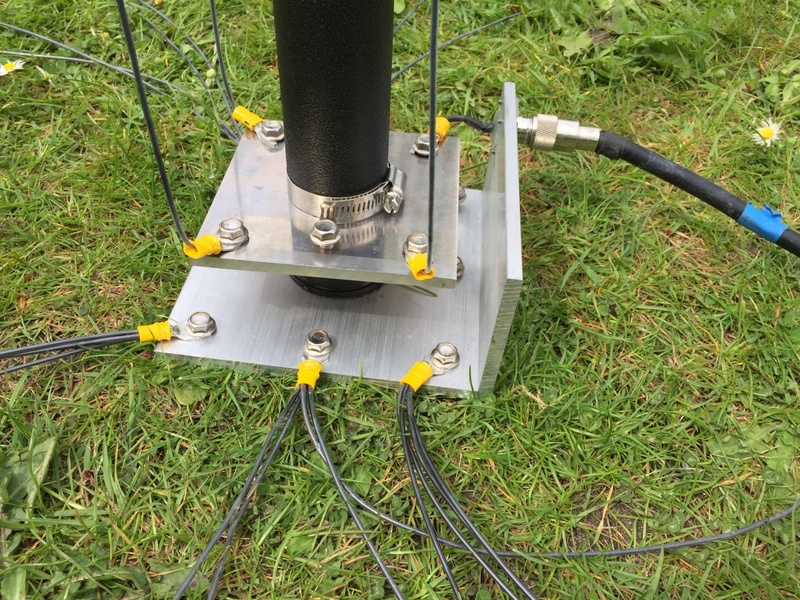 I wrote an article about this: https://www.m0mcx.co.uk/working-15m-band-on-a-40m-vertical-antenna/. Yes, your local (1000 mile) contacts will be very quiet, but also great for nulling out your close contacts as you reach your real DX. 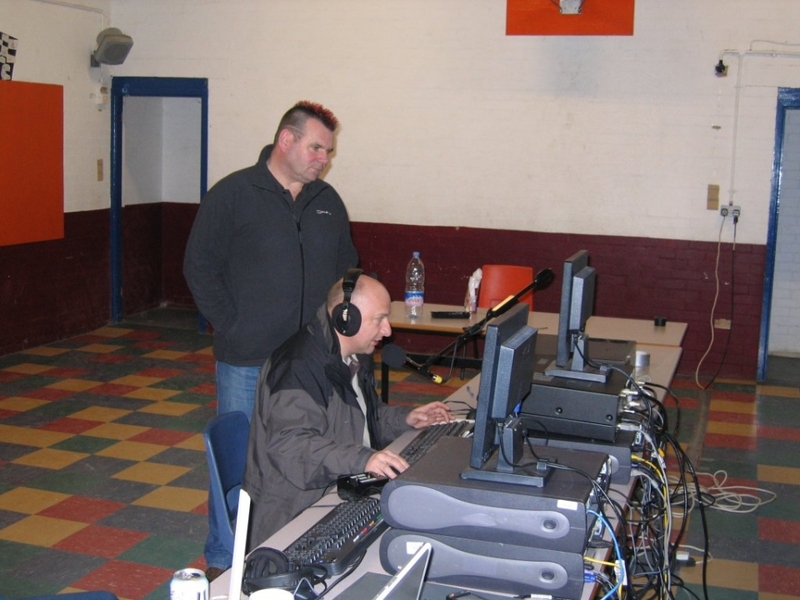 You can listen to me talking to JS1MZV and KB0EO on 15m (using my 40m quarter wave acting as a 15m 3/4 wave antenna) can be heard here: https://www.m0mcx.co.uk/audio-clips/. All the clips on that page were recorded using one single antenna with different lengths of quarter-wave antenna elements as discussed below. 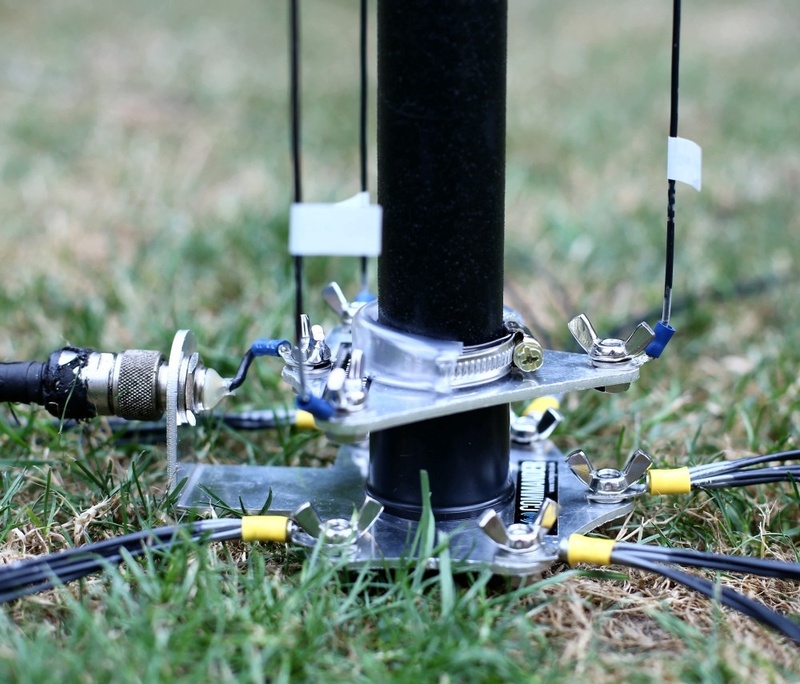 If you like experimenting, you’ll enjoy multi-banding these without a tuner by adding more elements as you would a fan-dipole. 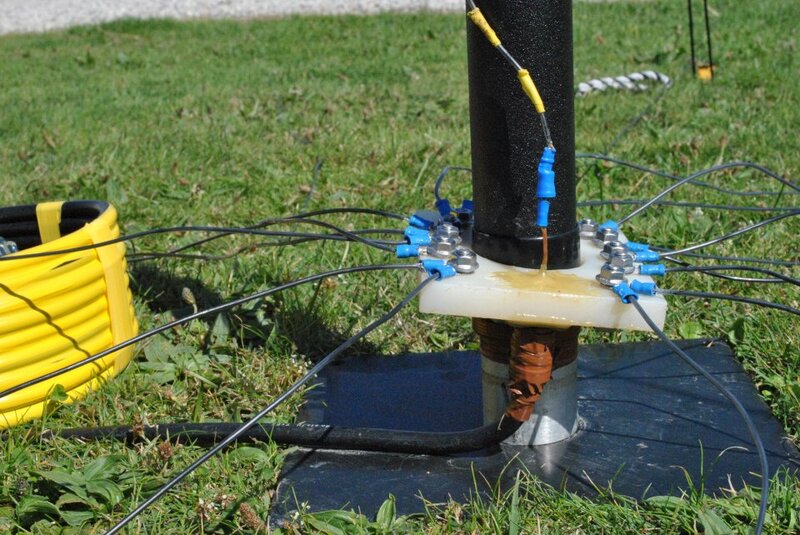 It’s easy to build a 40m, 30m, 20m & 17m all-band antenna (or even more elements). 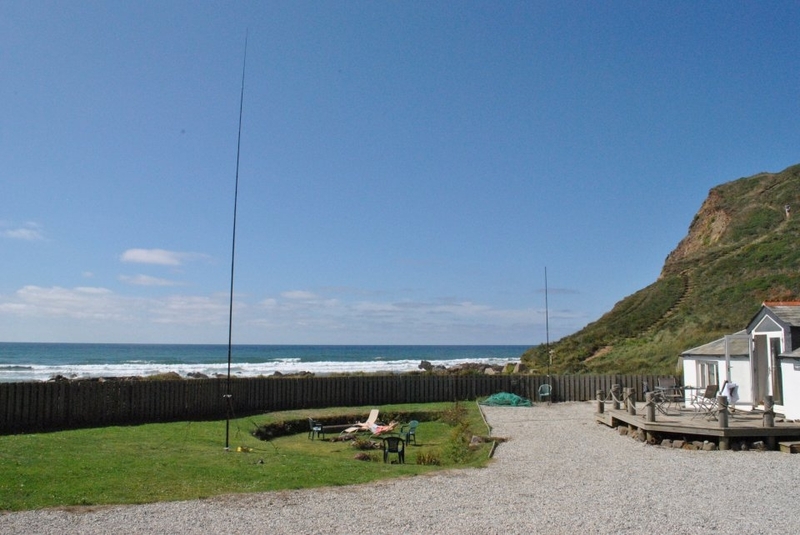 I made one last year and had a blast on holiday and scheduled my WSPR installation to switch between 40m and 17m. See my little film on YouTube. Paste this into your browser: “Intro to DX Commander youtube” and it’ll come up. I added a coil at the bottom once and made an 80m version. 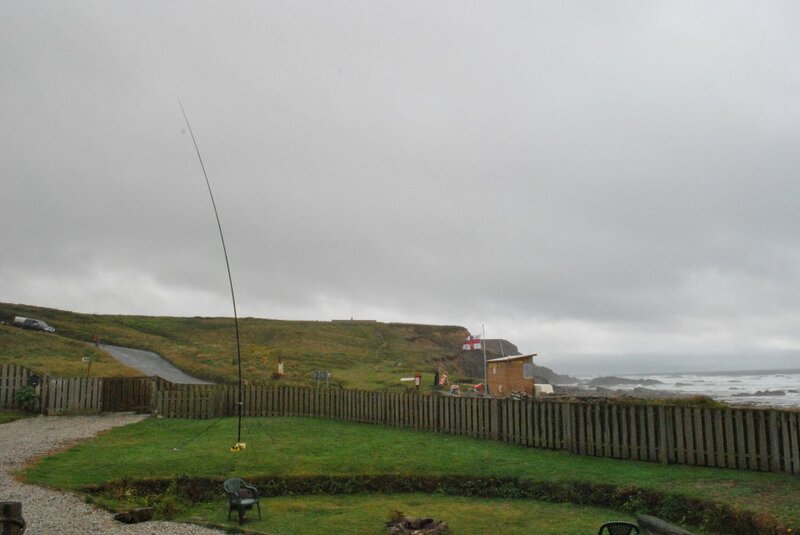 An option I have yet to construct personally is to linear-load say an 80m vertical by threading your wire right to the top and back down again with around 18m of wire. 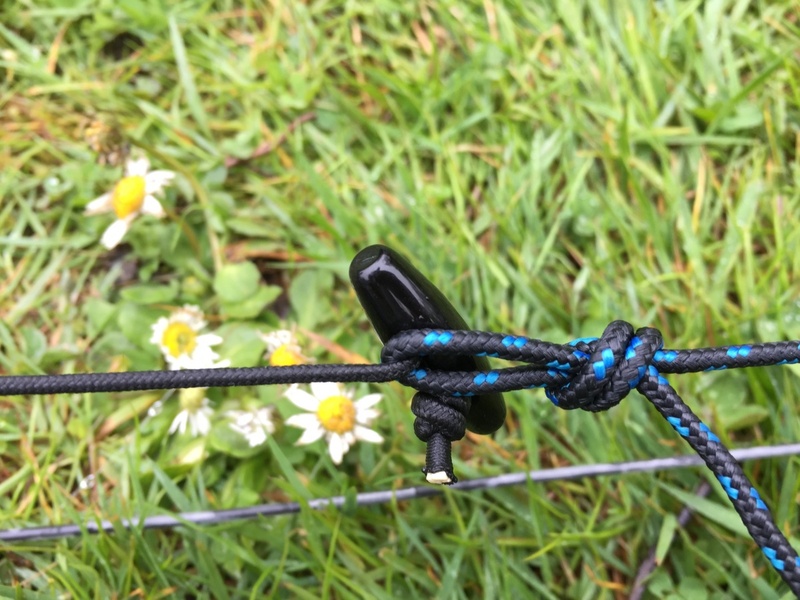 Alternatively, do the same with 40m by looping up and down at the half-way point and then threading a new wire right to the top for 160m by extending to a nearby tree for 160m. Lots of fun and options. 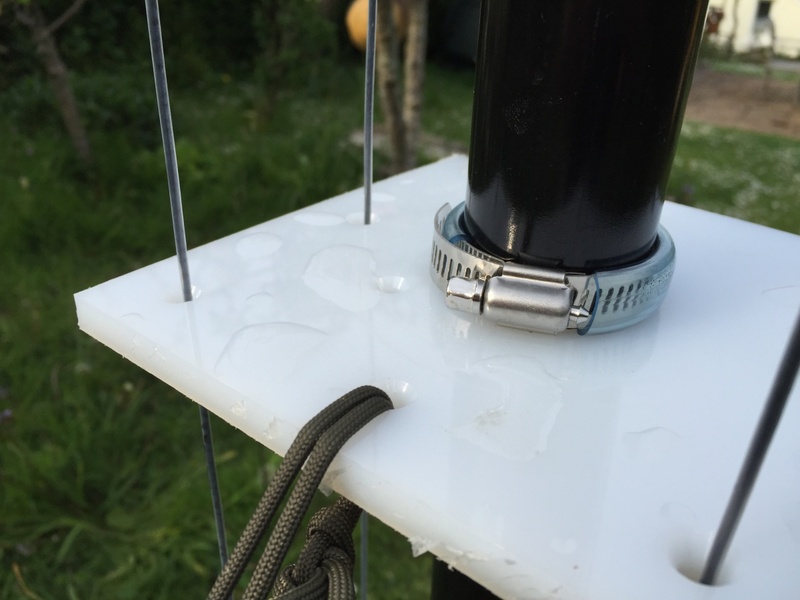 I have found that it is not necessary to tape each joint to stop it telescoping down on itself but for the sake of water ingress and long-term stability, I recommend you wrap a couple of turns of tape around each joint to keep the inside fairly dry and ensure that the friction fit stays true. Warning, the pretty shiny paint may peel off where the tape has been on for more than a couple of hours. 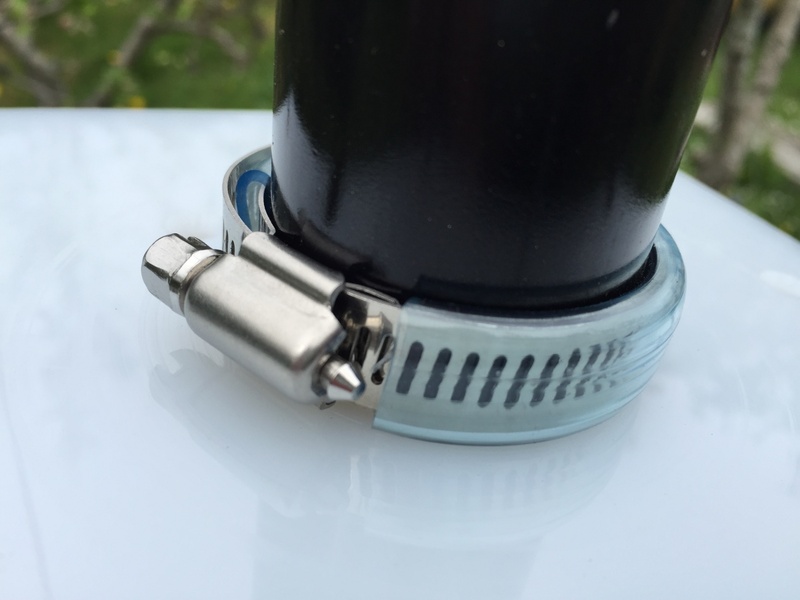 Better still then it to use hose-clamps (jubilee clips) with 8mm inside diameter aquarium tubing slipped over the top (you’ll need hot water to soften the tubing) )to create a really neat and secure clamp which won’t scratch the tube. 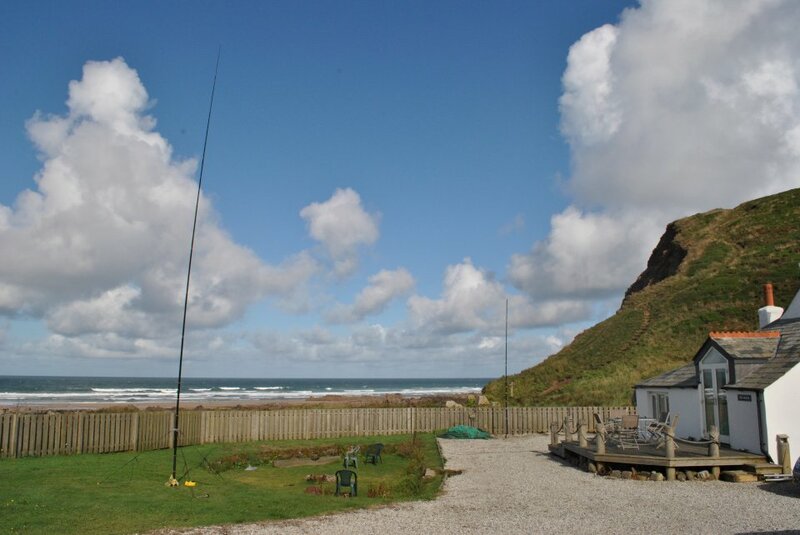 Ideal for week-long holidays and DXpeditions that only want a single antenna with no tuner (perhaps with an amplifier). 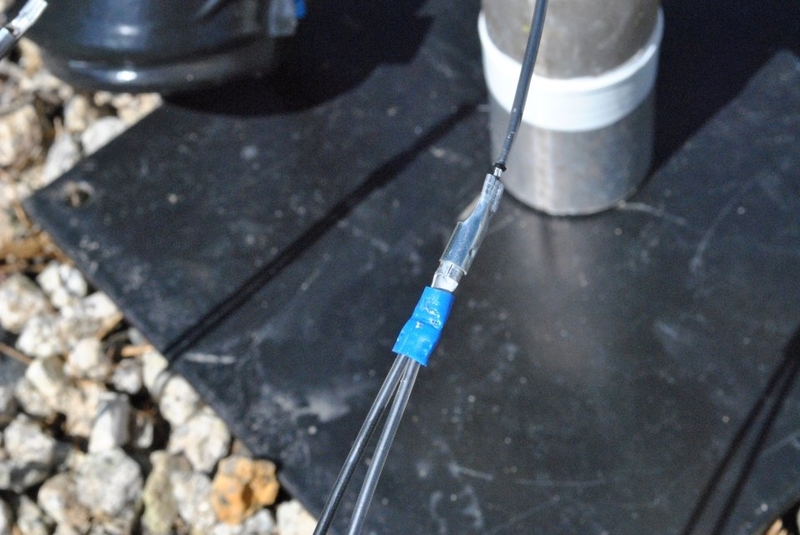 Cable-tie your wire antenna feedpoint to the very end of the last section, the one with the small ring at the end. 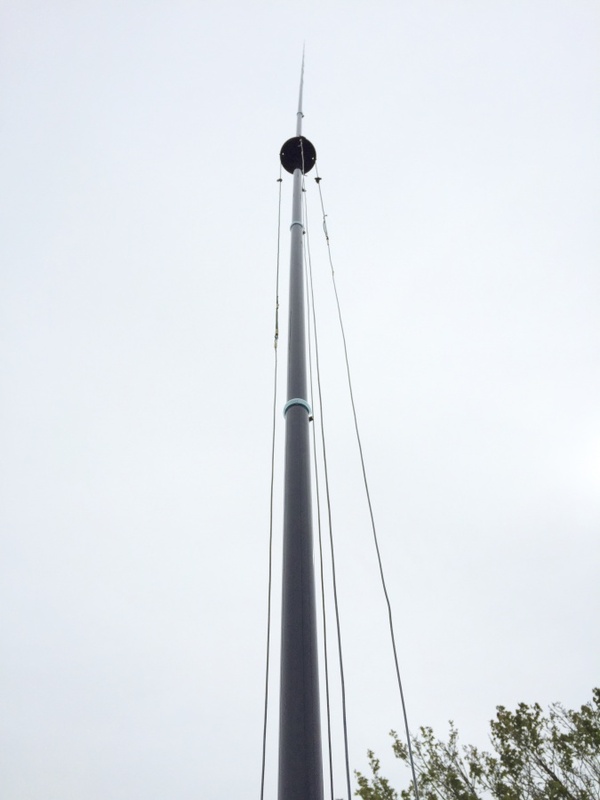 Remove the three top sections and drop this section back inside say the 7th section of the telescopic mast, leaving aside the remainder. 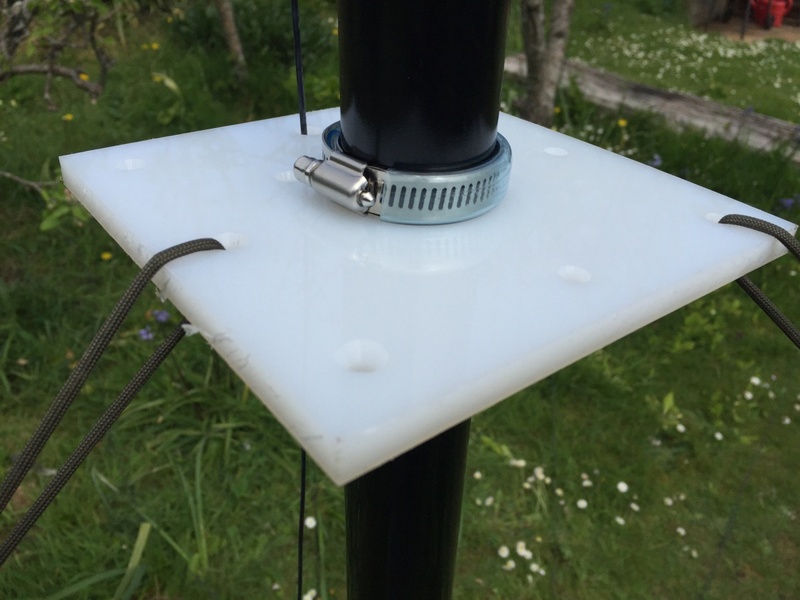 Now you will have an antenna approximately 7m in height on a strong mast that won’t waggle about too much. 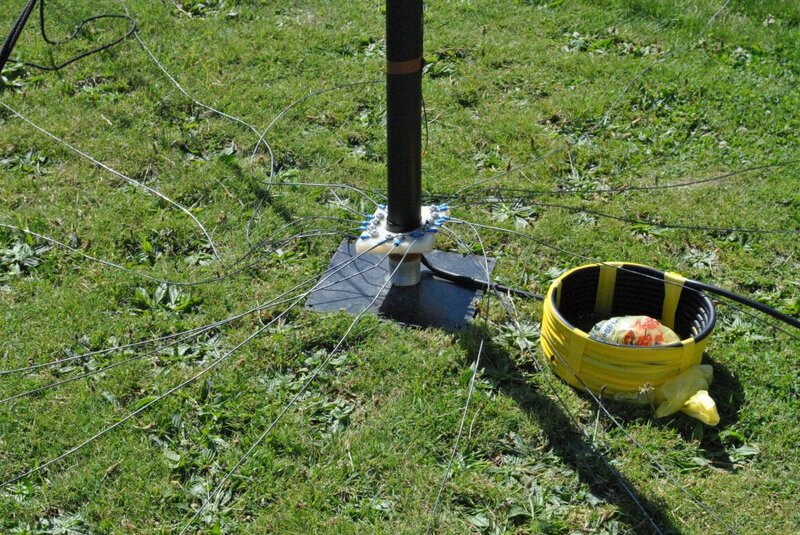 Do not try and mount a multi-band trapped dipole right to the top. 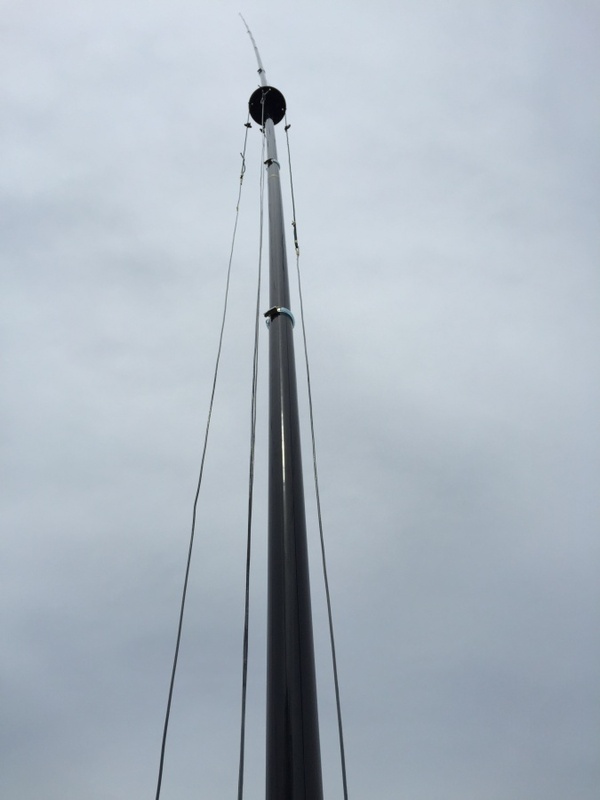 There are better options for supporting heavy aerials up high, not telescopic fibreglass poles like these. You can do the same as above but guy it too using my guy assemblies (contact me). 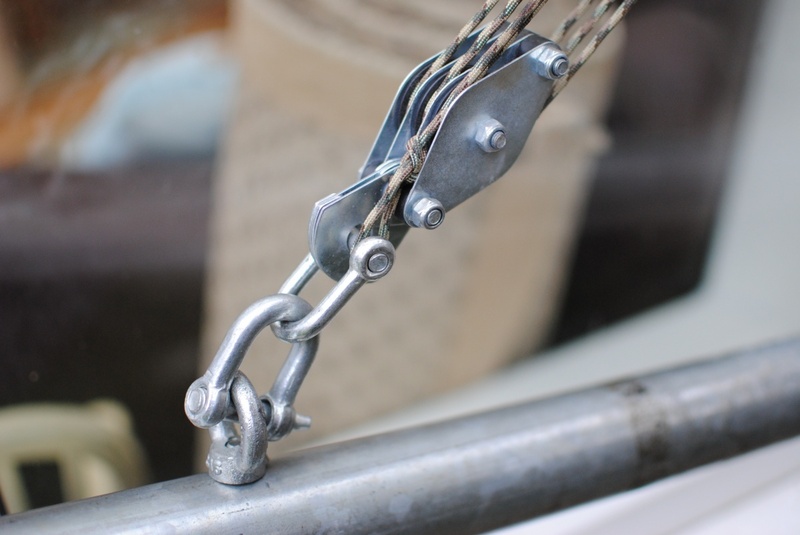 You could also tie it to a fence post or bolt to a wall. One customer used his 3D printer to make the equivalent of a custom Stauff Pipe Clamp Body. 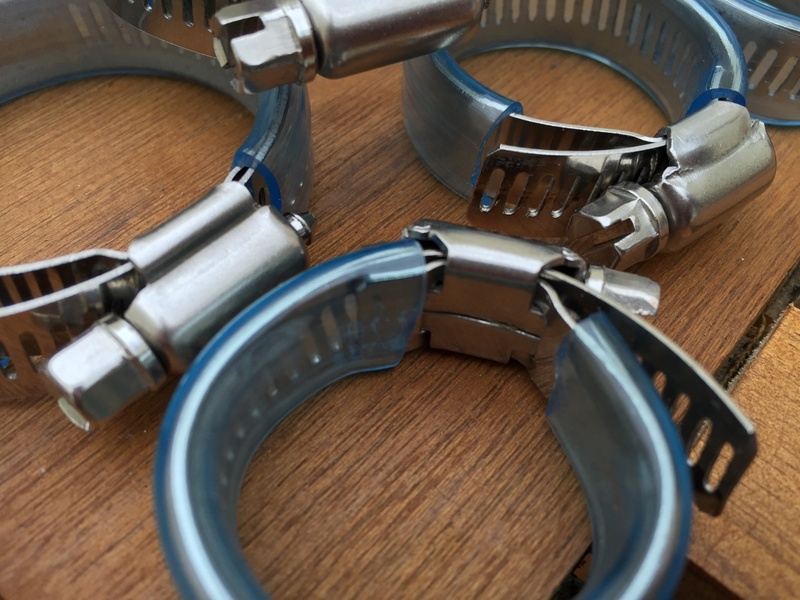 By the way, the pole is 0.25mm shy of being able to use these “scaffold” Stauff clamps (the ones at around 48mm) because they have too much tolerance to adequately support the lowest section. Stop press: I bought some 48mm versions and found that you can grind these down a teeny bit so they do clamp. I used rough grit sandpaper and slip the mating surfaces over the grit paper for 2 minutes and it took enough off. Alternatively, just wind a couple of turns of tape to increase the dimension a touch, just where you want the clamp to grip. 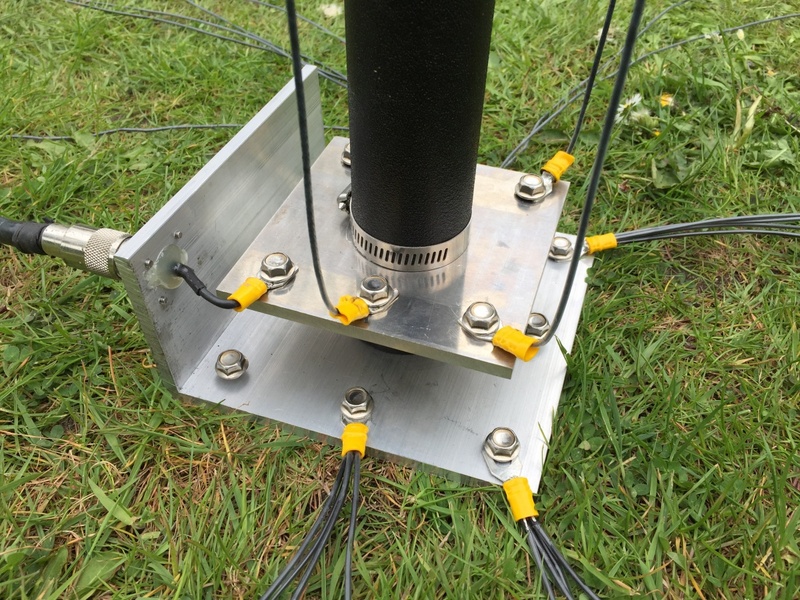 There has been much research done on radials however if you want a 50 ohm, great SWR curves and pretty good efficiency, use a minimum of 10 to 15 radials of around 10% of your lowest wavelength. So that’s 4m in length for 40m. 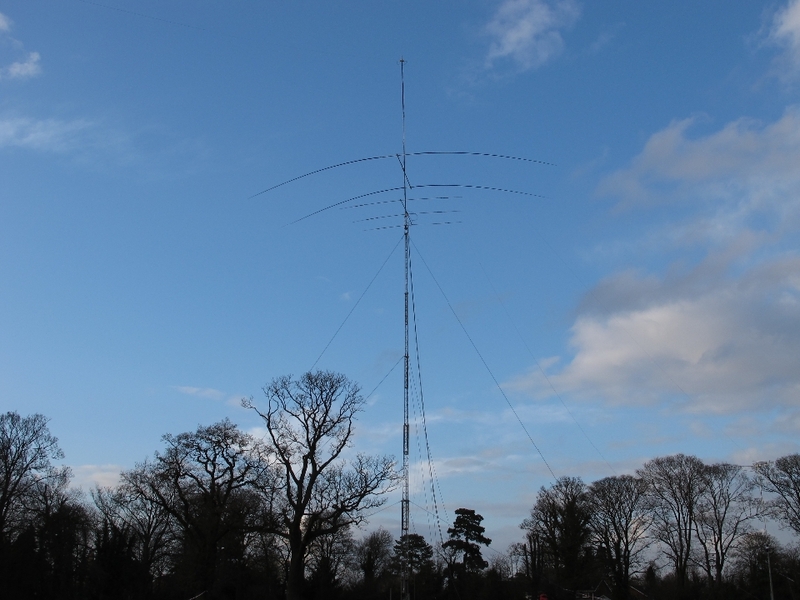 I have run pile-ups to the USA (from UK) on 40m with this arrangement. 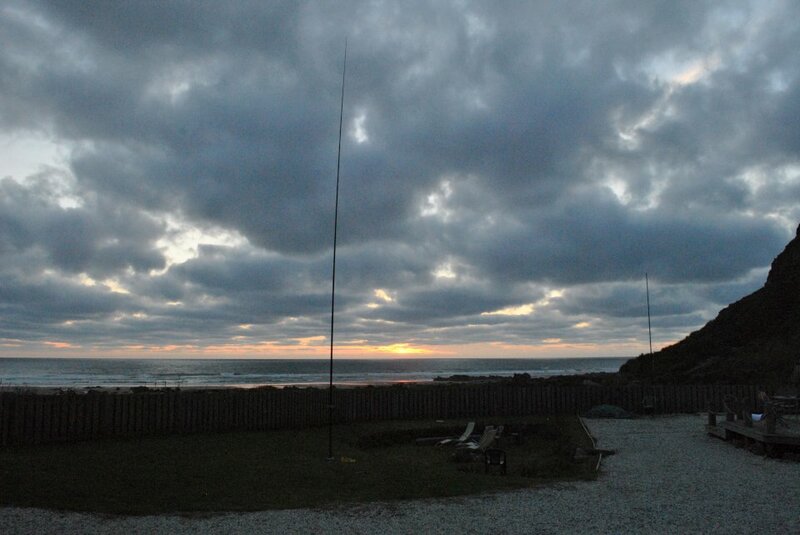 I have doubled the radials to 30 with imaginary (?) effect. Perhaps going up to 50 or 60 might have given me half an S point but seriously, you are into very serious diminishing returns. 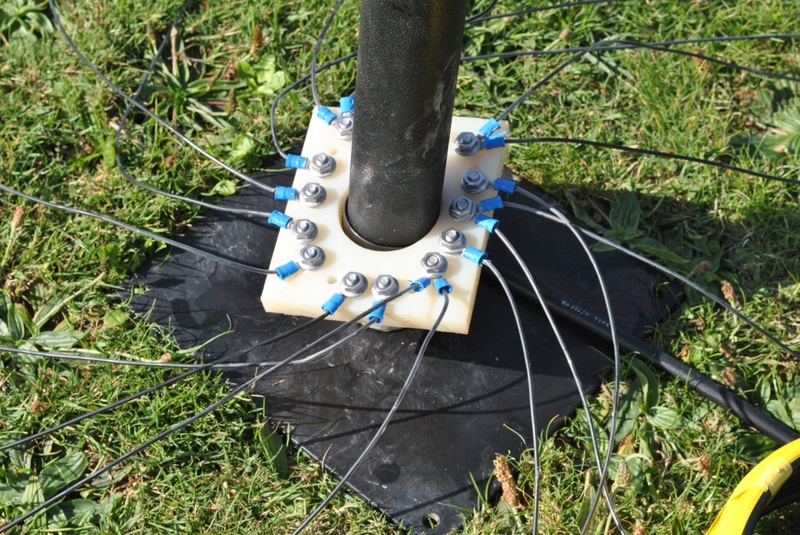 I lay my radials on the ground, and at home the grass has gradually grown over them. Use any copper wire you can find. No need to spend lots of money. Check various suppliers from ebay for a “100m equipment wire” for under a tenner. 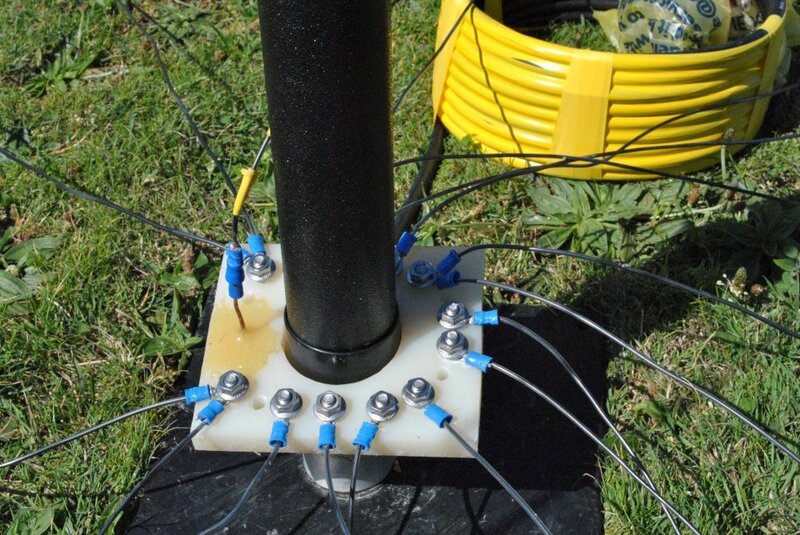 Effectively, you could make 25 x 4m radials out of a 100m reel. 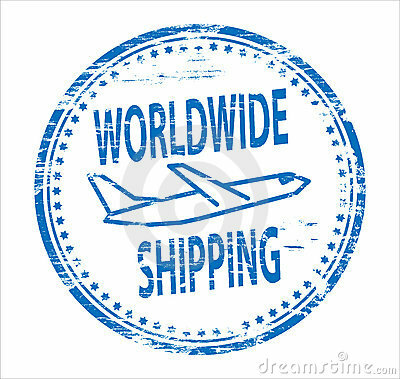 Choose your shipping option from below.